I hope you had a great garlic harvest this year! 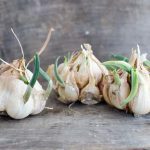 But whether you got a few pounds or a whole bushel, you’re going to want to properly manage the garlic to make the most of your harvest so when mid-winter rolls around you aren’t reaching for cloves that are rotten or bug-eaten beneath the papery outer layers of skin. We brought in a bunch of garlic from the field this year and what made it more exciting was that the garlic seed was saved from last year’s harvest! Which means we didn’t have to pay for expensive seed last year… and won’t have to again this year either! Garlic is ready to be harvested mid-summer once the tops begin to turn brown and die back. The good thing about garlic is that once it’s out of the ground, you leave it alone for several weeks to cure. 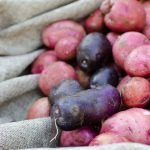 There is so much else that needs your attention in the garden and with canning this time of year! Thank you garlic for being low maintenance! After harvesting the garlic, you may consider laying it out on the ground and hosing off the dirt and mud that is clinging to the roots. It will make for easier work later, cleaner garlic, and speed drying time because the water you’re spraying it with is going to dry out a lot faster than a clod of mud clinging to the roots. 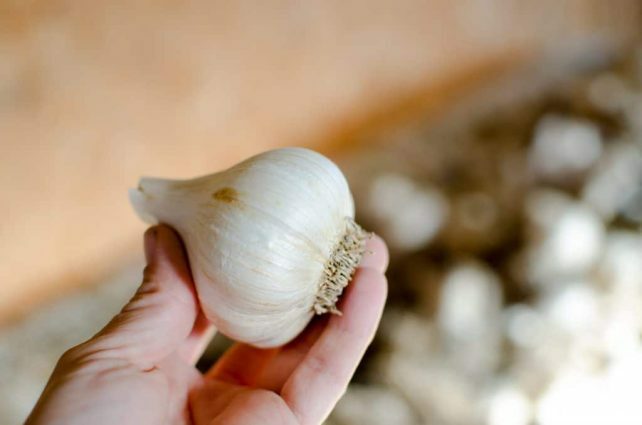 To cure the garlic, you need to place it in a warm, dry spot with good ventilation for several weeks until the stems are dried all the way through. We use our barn and sometimes will put a fan on it just to keep the air moving. This year I forgot all about it and didn’t check on the garlic for 6 weeks by which time it was fully cured and the bulbs had nice papery layers of skin surrounding them. Once the garlic is cured, sort it into hardneck and softneck if you grew both varieties. You can feel the difference by bending the stalks. Hardneck garlic stalks don’t bend, where as softneck varieties do. You can see in the image above why that is… the hardneck is on the left with the thick core. A softneck is on the right with papery layers the whole way to the center. Hardneck garlic will be stored in a basket or box, etc… Whereas softneck garlic will give you the beautiful braids to hang for display in your kitchen. Regardless of the type of garlic, your next step is to clean up the bulbs. Sure you could argue that this step could be skipped. After all, it’s just a little dirt, you’re the only one using it and you don’t care. But this is important because it’s going to let you really examine your bulbs to discover insects, digging damage, and decide where that bulb is best used. Ultimately this step is what’s going to save your garlic. • First, cut the stem off of the hardneck garlic, about 1-2″ from the top of the bulb. • Next, trim the hairy roots off as close to the base as you can without nicking the garlic. • Finally, remove the first outer layer of skin only. For soft neck garlic, peel the outer layer off all the way up the stem too so it’s cleaner and easier to braid. What’s left should be a beautiful head of garlic. At this point you need to evaluate your bulbs and divide them into one of three categories: Seed; Storage, or Further Processing. 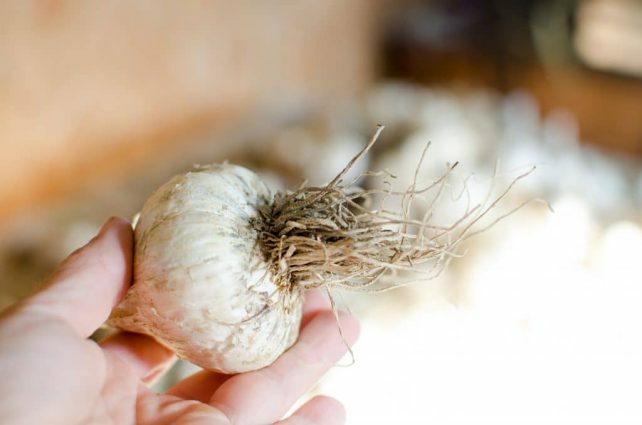 Save the largest bulbs with the biggest, most uniform cloves to be the seed for your next year’s garlic. Make sure there is no harvesting or insect damage. Find a warm, dry place and set these cloves aside in a basket for a few more weeks until you’re ready to plant. Be sure to make down how many pounds of garlic seed you’re saving in the SmartSteader homestead management app. 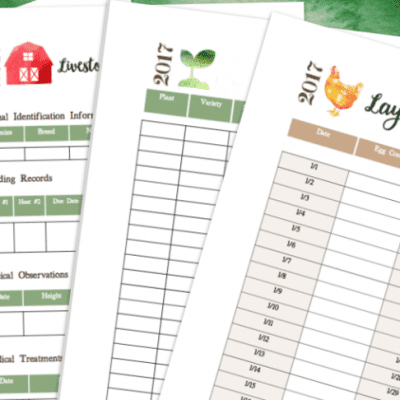 Knowing that information will help you better plan how much seed you need to save next year after you see the harvest come in! These are bulbs that are small, misshapen, and not good for seed, but otherwise are undamaged. But they’re perfect for eating. These bulbs you will store in a dark, dry place in your home or if it’s soft neck garlic, braid it for hanging. From these cloves, you’ll also have 3 piles. • Those that are indeed only fit for composting. They’re just too damaged or bug-eaten to salvage. • Those that are no longer protected by a paper covering. 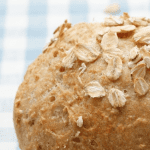 • And those that are perfectly fine otherwise and you can still save for using later in the kitchen. I put those in a bowl under my island and use these cloves first. Just in case.Usually, they go into my late summer canning recipes like my high yielding tomato sauce, fresh salsa, or jalapeno relish. Any garlic you save for seed will need to be placed in a dry, well-ventilated place for a couple of months until it’s time to plant in late fall before the ground freezes. The storage garlic will need to be stored in a similar way, preferably where it’s also cool and dark. Garlic exposed to too much warmth and light will begin to sprout sooner in the winter. I like to braid my softneck garlic to keep it nice and neatly bundled. It takes up a lot less room than a basket. Hopefully, this system of managing garlic will help you keep a year-round supply of fresh garlic to meet all of your farmstead kitchen’s needs! ‘Cause there’s nothing worse than thinking you still have fresh garlic in March and finding out that when you peel it there’s nothing underneath but shriveled, rock hard, bug-eaten cloves! Thank you so much for this post! I have shied away from growing garlic as I had no idea how to deal with it once grown. Your post has made me able to think about planting some this fall. You are always thorough and perfectly clear with your posts. 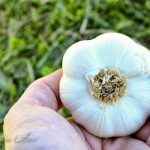 I never washed my garlic before for fear of promoting mold – great to hear the moisture won’t hurt it!! I’ll wash in the future.